SPARK > News > Big Changes in SPARK Version 6.6! Our release notes cover what’s new, what’s changed, and the bugs that we’ve fixed since our last release of SPARK. As always, we welcome your feedback – support@lendwithspark.com. Fee Changes: SPARK now has a “Yes/No” question to designate whether a fee is due at closing or paid outside of closing. You can find that underneath the “Financed?” header in SPARK. Additionally, you now have the ability to mark a fee as paid without having to associate it to a specific invoice. Borrower Deposit Tracking: We’ve added new custom features to Borrower Deposit Tracking, such as creating a deposit schedule based on a particular loan product in SPARK. You can also track multiple deposit installments and even track refunds given to the borrower. The Deposits tab will have a whole new look and feel after this release! Automated Closing Statement: Due to the changes made in the Project Accounting section of SPARK, updates were also made to the Closing Statement display and generation. The Closing Statement template now has a “Credits” section and “Debits/Disbursements” section, which is an updated to the previous format for the Closing Statement. 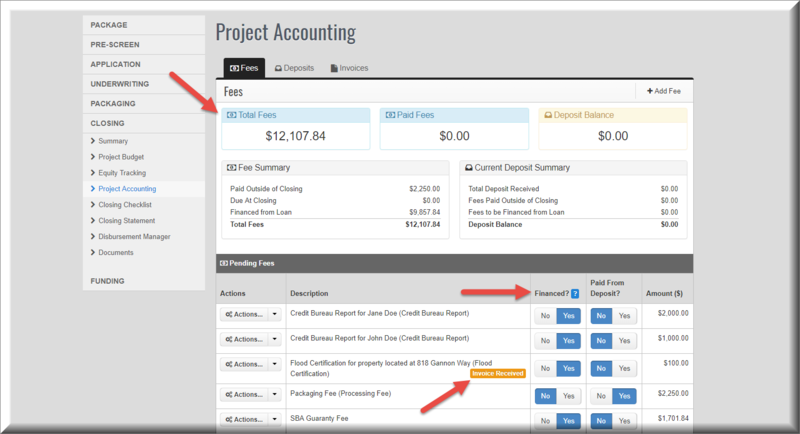 Furthermore, the Closing Statement is automatically balanced based on the information entered into the Project Accounting section of SPARK. You may have to answer some additional questions about how the funds will be allocated, but you won’t be able to edit the amounts on the Closing Statement going forward. SBA Form 1919 (Personal History Statement): Prior to this release, question number 10 on SBA Form 1919 was based on the applicant’s answer from the Business History form. After lender feedback, we’ve found that applicants answer this question incorrectly on the Business History Form, leading to incorrect responses on the 1919. In an effect to correct this mistake, the answer to question 10 on SBA Form 1919 will default to “Yes”. This will not affect the Business History form. Verified Documents: Once a document has been verified in SPARK, it will now appear as a “Read Only” document to external users. Additionally, internal SPARK users now have the ability to mark documents as “verified” from the Documents page in SPARK. Notifications Page: This page will no longer lock, even if the rest of the loan package is locked. Information Request Reminders: If an individual is removed as an Authorized User from a loan package, they will no longer get the notifications associated with Information Requests. Financial Analysis Configuration: Resolved an error that would appear if you attempted to save a Financial Analysis that has an Account with no Sub-Account associated to it. Lender Management: Resolved a bug that prevented the 9-digit zip code from saving when a new lender was created in SPARK. Active Information Requests: Fixed a bug that allowed Information Requests to become “Active” while still having “Draft” workflows. Homepage Widgets: The “Select Columns” homepage widget will no longer be visible on role-specific homepages.